When a wet, windy foul weather day, turns out to be a great day! Forecast for Coastal Waters around Anglesey on Saturday suggested rain, winds (WSW/W, F6). They weren’t wrong. The drive onto Anglesey was miserable…. And Paul’s wipers had a temporary ‘moment’, deciding to stop working! Holyhead Truckstop was the usual oasis and we bumped into Jim Krawiecki and his group who were heading off to Trearddur Bay to do some rescue practice. We felt wet enough already. The coffee and humour had worked it’s wonderful ways as we headed to Porth Llechog ( Bull Bay). And enthusiasm was back to normal as we got on the water, hiding (too hot) in dry suits and working our way under the rocks and cliffs of the most Northerly mainland of Wales. Great paddling and with low tide, stunning environment and Geology. Lunch was at Porth Wen, commonly known as ‘The Brickworks’. In Victorian times they made bricks here. Rather special bricks using local quartzite. These bricks were not only hard but able to withstand very high temperatures, essential to line the industrial furnaces of the time for the manufacture of steel. All interesting stuff but lost to the humour of friends Barry Shaw and James Stevenson who were with a group! Launching was delayed as Geth rooted out a ‘Sea Squirt’, so named because they squirt out water when disturbed and more closely related to vertebrates like us than invertebrates. We were now chilly so headed West. Once out of the Bay we were paddling into the full strength of the wind. We paddled West of Middle Mouse before starting a ‘ferry’ out to the island. As we entered the eddy line, a call from Paul as a Common Dolphin (http://www.seawatchfoundation.org.uk/common-dolphin/) was racing and turning just behind my kayak. Wonderful! The ‘ferry’ became somewhat technical as we neared the island. Strong wind, clapotis and tide race joined forces to make quite tough paddling. The North side of the island was a blast. Fast surf waves and wind behind! The GPS track would be spaghetti as we repeated ‘runs’. All with the fabulous backdrop views of the North Coast. 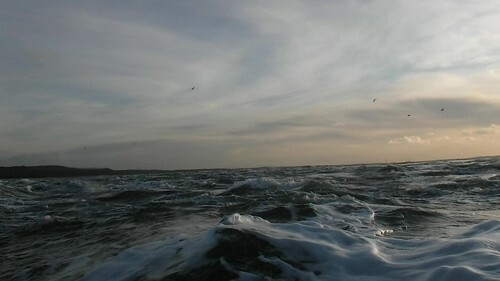 Return to Bull Bay with wind behind and the flood tide was very quick. Even the rain had stopped. Yet again, a foul day turned out to be a great day! Written by Rich. Photos by Geth. 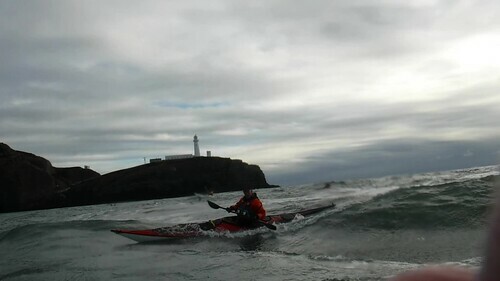 A fantastic wintry trip out from Porth Dafarch to South Stack on a 9m (Liverpool) ebb tidal stream. The swell provided interesting rockhopping. The big chanels between Penrhyn Mawr and Abraham’s Bosom. Paddling today were: Paul, Richard, Ed, Rachel, Lynn, Steve, Gary, Jan and Geth. Paddling today were: Paul, Rich, Rachel, Steve, Peter, Jan and Gary. Good surfing at Middle Mouse Island and Llanlleiana Headland. Then end of the day photo. Thanks to all for a great day! A great day out with Ed for our first trip of 2018 to The Skerries. 9.68m Tide Liverpool. SW Swell 0.8m, 10sec. Negligible wind. 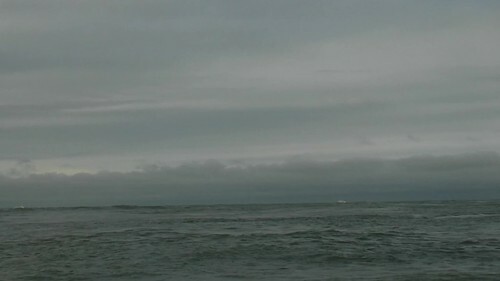 We arrived at Harry Furlough’s at 12:00 for the start of the ebbing tiderace and surfed there for one hour. We arrived at The Skerries at 13:50, following a surf at Victoria Bank. We departed The Skerries at 14:20, to attempt the crossing of Carmel Sound. The ebb current was now at its strongest rate. The Platters on lively form. Arriving at Carmel Head’s ebb eddy, adjacent to Ynys Fydlyn, at 15:00. Rounding Carmel Head on our way back to Cemlyn at 15:20. The view back to The Skerries. We arrived back at Cemlyn soon after 16:00.